I started monday on my long tour home in my car - from South of France to Norway is some distance to drive. Today I left France and is tonight in the small and charming village by the banks of the Mosel river: Cochem in Germany. Still many tourists around in this popular village. Cochem is a traditional German town with half-timbered houses and an exceptionally scenic location on the Mosel river in Rhineland-Palatinate, Germany. Population about 5,000 and a population of 8700 in a 7 km radius. 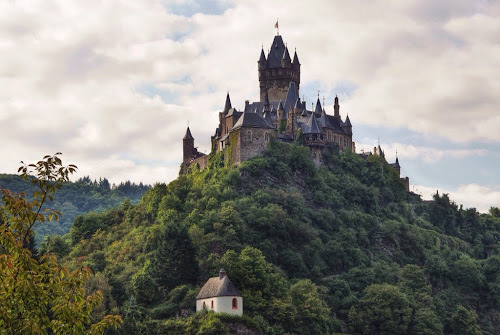 Cochem Castle, (Schloss Reichsburg), on its high elevation, overlooks the area. It dominates the town and is an impressive feature.